Aborted Asmodeus Asphyx Brewed&Canned Dark Funeral Darkane Darkfall Distorted Impalement Dying Fetus Erebos Fleshless Funerus God Dethroned Hail of Bullets Hollenthon Holy Moses In Slumber Incantation Keep Of Kalessin Manegarm Mentor Obscurity Parsifall Primordial Riger Sanatorium Shining Skyforger Suicidal Angels Triptykon V.P.O.A.A.W.A.M.C. The edition in 2010 will be strictly limited to 1.700 festival passes and 300 one-day tickets per day, so make sure you get your ticket right in time! Tickets are limited to 1.700 festival-passes und 300 one day-tickets each day! The admission on Thursday is free! Besides the festival area, the camping site around the inn “Gasthaus zur Schieferwiese” will offer a stay in great outdoors, without missing comforts like a relaxed guest area, toilets, showers and a special metal-breakfast. Non-campers have the possibility to rent a room in one of the guesthouses next to Spital am Semmering. The professional team of Solutions International will take care of the visitors security at the festival- and camping area, and will be on location all around the clock. In addition the festival crew will provide guides, regulators and medical service as well. 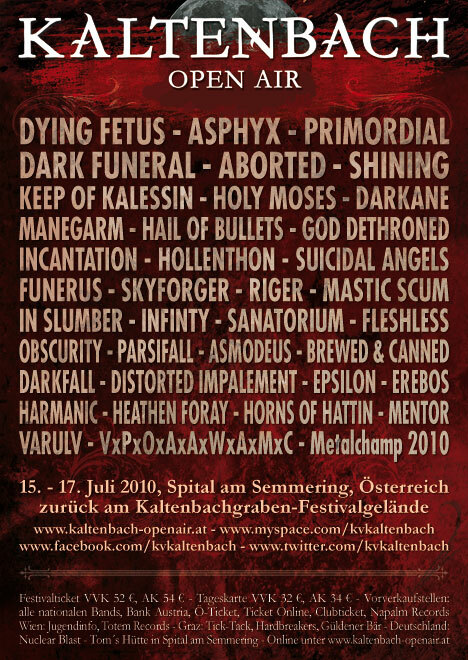 Kaltenbach Open Air starts on Thursday, the 15th of July 2010, the entry on that day is free, therefore also the liveshows of the bands! On Friday and Saturday the festival continues in normal style, after the last live act an aftershow-party will take place in the party tent at the festival area on every day!